Open movements in education, government, technology, science, and more are working to remove barriers that prevent the public from fully accessing these institutions, systems, and fields. Underlying each of these movements is one critical need: open use of information, much of which is funded through public investment. The federal government collects, produces, and distributes more information than any other organization, public or private, in the United States. Unfortunately, restricted access to this information is all too common, and comes with real costs.“Barriers to public use of information stifle scientific advancement, social innovation, cultural understanding, and education—in short, the ability to learn and progress as a nation,” senior policy analyst Lindsey Tepe argues in a new report from New America’s Education Policy program. InThe Case for Open Use Policies: Realizing the Full Value of Publicly Funded Information, Tepe details efforts to make valuable government information—including data, academic research, and other educational resources—more open, especially during the previous eight years of the Obama administration. Starting with a modest request for each federal agency to identify three high-value data sets to make openly available to the public, data.gov was built to house critical information on education, health, energy, governance, and more. Agencies funding more than $100 million in research and development were required to put in place a plan to make that research more accessible. Further, the Departments of Labor, Education, and State, the National Institutes of Health, the National Science Foundation, and a number of other agencies have piloted the use of Creative Commons Attribution (CC BY) licenses with some of their grantees, allowing the public to openly use resources produced with each agency’s limited competitive grant funds. 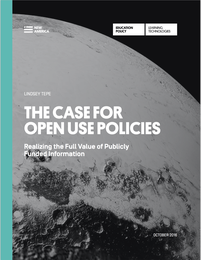 The Case for Open use Policies outlines recommendations that would move the federal government toward stronger open use policies, to make the free exchange of information and ideas a reality. The full paper with recommendations is available here.